This show-stopping dessert recipe is simpler than it looks. 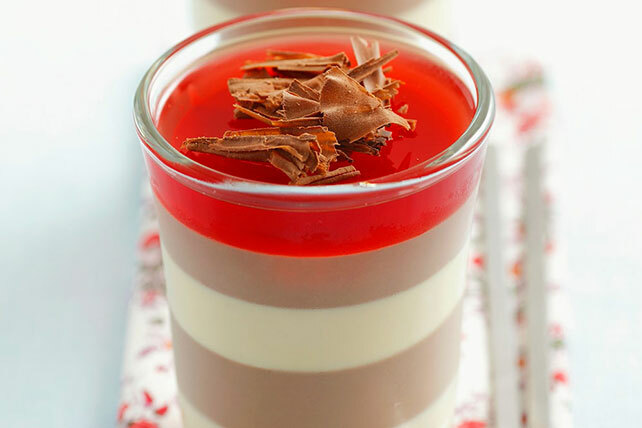 Layers of chocolate and vanilla pudding look elegant in see-through glasses. Topped with a layer of bright JELL-O and chocolate curls, these easy-to-assemble parfaits are a welcome end to any meal. Beat vanilla pudding mix and 2 cups milk with whisk 2 min. Reserve half of vanilla pudding for later use (see tip). Repeat with chocolate pudding mix. Stir in Cool Whip to half of chocolate pudding. Reserve other half of chocolate pudding for later use (see tip). Divide half of the vanilla pudding evenly between eight parfait glasses (about 2 Tbsp. each). Add 2 Tbsp. chocolate pudding mixture to each glass; repeat layers. Refrigerate 1 hour. Remove glasses from fridge. Prepare jelly powder as directed on package. Add 2 Tbsp. to the top of each parfait; reserve remaining for later use (see tip). Chill until set. Top with chocolate curls. Serve extra pudding and jelly as quick snacks. Warm chocolate by microwaving it on HIGH for a few seconds or just until you can smudge the chocolate with your thumb. Hold chocolate piece steadily, then draw a vegetable peeler slowly over the chocolate to form shavings.